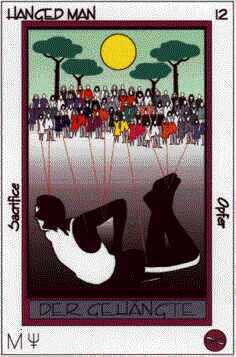 "There ain't no free lunch" This belief characterizes the "Hanged Man" like no other. Only struggle leads to success and the one who doesn't struggle is a burden on everybody else. The situation can be seen from quite the opposite angle, the struggler creating a stressful and unsupportive atmosphere all around him, hanging onto colorfully alive people amidst his gray world(-view), thus effectively pulling down the energy of his surroundings. Midheaven/Neptune: Personal illusion, insecurity Theme for contemplation: Do you deserve to live? Affirmation: "My life is a servert from me to myself" Hint: Release all images of worth or worthlessness based on comparison. You have done nothing to live, and nothing is asked of you. All human expression is joyful life, even if camouflaged as ,hard work". 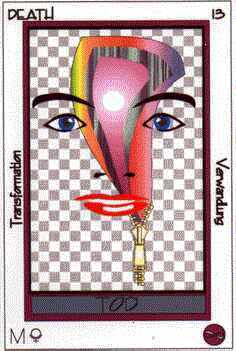 "Death is the greatest of all illusions" The gray plaid pattern of the limited three-and-a-half dimensional world we choose to act in for the time of corporal existence is temporarily opened by the zipper of meditation, awareness and vision. The white light of ultimate understanding is positioned between the open eyes that see this material world. To reach there, various layers of increasing formlessness will have to be met and understood, until finally, the center of the cyclone is reached. This can happen Here Now, in deep meditation, and if the body is ultimately left while one is firmly rooted in a state of wakeful awareness. Midheaven/Pluto: Ultimate understanding, transformation. Theme for contemplation: What dies, what is eternal? Affirmation: "I am more than the sum of my body and mind" Hint: Be open for possibilities of existence without a physical body. Start reading books on OOBEs like ,Out of Body in 30 Days" and watch your dream activities, maybe even start a diary. "There is no peace of mind, only peace of No- Mind" The hobo giving up on the seemingly overburdening outside circumstances of life and killing what's left of awareness with alcohol and drugs, and the soldier on the lookout for the enemy outside of himself draw their life-energy from the same source to which they are free to return at any moment, as soon as they choose to focus inside. In the meantime, the neglected inner portions of their diamond-clear soul is shining constantly upon them, patiently waiting for them to turn around and within. Midheaven/Venus: Harmony, unconditional helpful attitude. Theme for contemplation: Watch your mind, Vipassana. 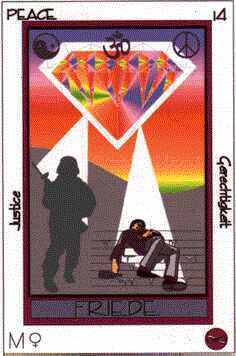 Affirmation: "I am the watcher" Hint: Learn to disassociate from the happenings around you. Let the quality of silence enter your mind.